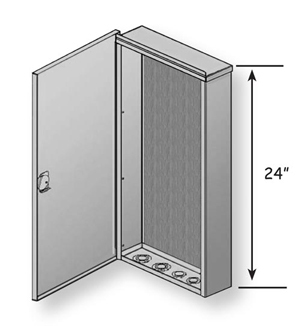 This enclosure is made of 16-gauge zinc-coated fabricated steel with a hinged door. Both are powder coated with a tan finish. This surface mounted service box is fully enclosed. The door is embossed with the word “Communication”. It also includes a 1/2″ plywood backboard for easy mounting of low-voltage utility equipment, and a 4-position #4-14 wire ground bar is mounted inside. The BN14244W-SM is UL listed (UL1863) and designed to NEMA 3R Specifications. The reinforced hinged door fastens with a standard 7/16″ can or socket wrench.This enclosure is nailed or screwed to an existing surface. 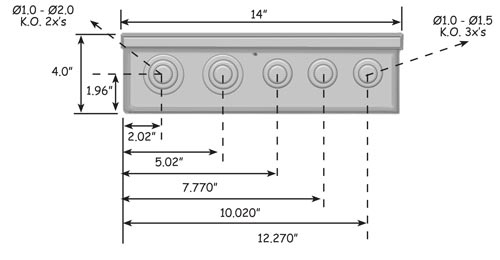 This enclosure includes 2 bottom knockouts 1″ to 2″ (for 3/4″ t0 1-3/4″ conduit) and 3 bottom knockouts 1″ to 1-1/2″ (for 3/4″ to 1-1/4″ conduit). This exterior surface mounted enclosure is specifically designed to house communication / utility/security/home audio-video wiring demarcation devices.